This week I was asked to create a component-diagram at my new customer. 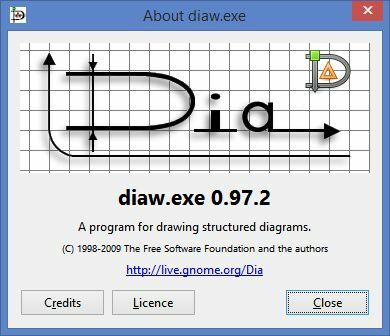 They use DIA as an alternative for Visio. Funny thing is that it apparently orginated from Linux/Gnome, since the file-explorer resembles the File-browser of Gnome. But it has also a Windows installer. In the bin folder of the Dia-installation-home, there is also a dia-win-remote.exe. It takes one of the other exe's (dia.exe or diaw.exe) as an input. If you add the option "--integrated" it will show the combined window. The mere reason that I dug into SSM yeasterday was that I wanted to install the Oracle Database 12c. I ran however against the prerequisite check on the swap space that was only 2GB because of my default OL7 install. And the Universal Installer required 8GB at least. So I needed to expand it. There are several ways to do it. But since I was into SSM, it was a good practice to use that. And it turns out very simple to do. It shows how easy it is to add a new device to a pool and an existing volume. So I created a new disk of 8GB to my VM (I only need 8GB, but I thought I'd simply add it to the existing 2GB, to be certain to have enough with 10GB). Size of logical volume ol/swap changed from 2.00 GiB (512 extents) to 10.00 GiB (2560 extents). mkswap: /dev/mapper/ol-swap: warning: wiping old swap signature.